Ogunlade, who was alleged to have defiled a 20-year-old girl with autism disorder. 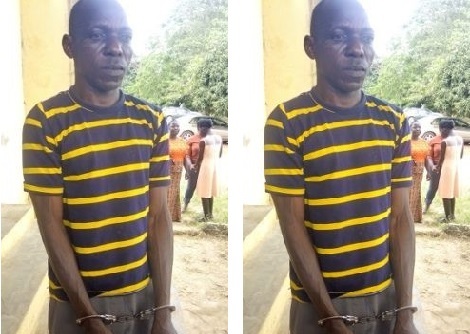 Ogunlade, a 50-year-old carpenter, who was invited to work in a house belonging to a family friend of the victims, lured the girl into the bathroom and took advantage of her condition raped her. The suspect, Ogunlade who confessed to the crime described the incident as the handiwork of the devil, saying he could not explain how the incident happened. He explained that ” I was working in their house when I saw the girl and I touched her and she hugged me before I put my finger into her private part. “I did not sleep with her but I fingered her. It was when she was going that I noticed she was stained with blood and I followed her to the bathroom to clean her up. But the State Police Public Relations Officer (PPRO) Mr Femi Joseph, confirmed that the young lady with the autism challenge was raped by the suspect. The police image maker, however, said the father of three would soon be arraigned in court after the conclusion of the investigation.